Troops and vehicles from every NATO member are converging on Norway for the biggest exercise in years. The exercise highlights their commitment to collective defence and practices operating in harsh conditions. It’s also a chance for NATO militaries to flex their logistical and mobility muscles. More than 40,000 personnel, 10,000 vehicles, 130 aircraft, and 70 vessels from 31 countries are descending on Norway for Trident Juncture, NATO’s largest military exercise since 2002, which comes as NATO countries reorient themselves toward large-scale conflict. For the UK and Germany, two of NATO’s biggest militaries, the preparations are a chance to flex a different set of muscles – ones that atrophied after the Cold War, when the potential for great-power conflict waned. In the coming days, more than 70 of the British military’s Foxhound, Husky, and Land Rover vehicles will trek some 1,200 miles from Hoek van Holland, Netherlands, to training areas in Norway, travelling through the Netherlands, Germany, Denmark, and Sweden to “test how efficiently soldiers and equipment can move between European countries,” according to a NATO release. Meanwhile, German troops departed Emden on the Baltic Sea in a civilian cargo ferry loaded with Leopard tanks and other military vehicles, scheduled to arrive in Fredrikstad in southern Norway on October 11. “We haven’t done this … since the Cold War,” Dutch Brig. Gen. Hans Damen said as British army vehicles arrived in port during the early-morning hours on Wednesday. In total, the UK is moving some 600 armoured vehicles, jeeps, and supply trucks with 1,200 troops overland to Norway in a 10-day period ahead of Trident Juncture. The German and British movements come in preparation for Trident Juncture, but NATO members, led by the US, have reemphasized mobility and logistics on the continent in the years after Russia’s 2014 incursion into Crimea – an event that convinced the alliance the risk of a conventional ground war was growing. The US and its NATO partners have refocused on many of the capabilities they had during the Cold War – “so increased artillery and air interaction, manoeuvre, river crossings, all of these things,” Ben Hodges, a retired Army lieutenant general who led the US Army in Europe between 2013 and 2017, told Business Insider earlier this year. US Marine Corps/Sgt. 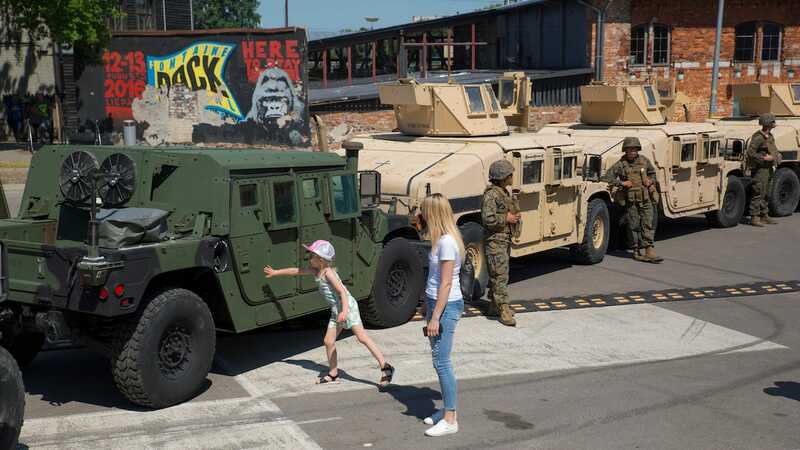 Adwin EstersLatvian visitors view US Marine Corps HMMWVs during an event demonstrating military vehicles and gear involved in Exercise Saber Strike, in Liepaja, Latvia, May 30, 2018. A NATO internal report seen by German news outlet Der Spiegel at the end of 2017 found that the alliance’s ability to rapidly deploy throughout Europe had “atrophied since the end of the Cold War” – in part because of bureaucratic and logistical hurdles. Those challenges were illustrated in January, when a convoy of US Army Paladin self-propelled howitzers travelling from Poland to southern Germany were stopped by German border police because the Polish contractors transporting them didn’t have the proper permits. NATO has made structural changes to address this, setting up a dedicated logistics command in southern Germany to oversee operations on the continent. “This command is going to be responsible for the rapid reception and responsiveness and reinforcement of NATO forces to the eastern flank, or anywhere, actually,” Hodges said this summer. NATO has also worked with European members and the EU to ease movement across national borders. US Army/Staff Sgt. Kathleen V. PolancoGermans stand next to US soldiers as they watch the 2nd Armoured Brigade Combat Team, 1st Infantry Division, drive on German roads from the Grafenwoehr Training Area to Hohenfels, Germany, April 22, 2018. “Looking ahead, we aim to further reduce border-crossing times (clearances within five days by the end of 2019), identify alternative supply routes, and exercise even more to practice military mobility,” Lungescu added. Other operational “firsts” underline the shift in thinking. 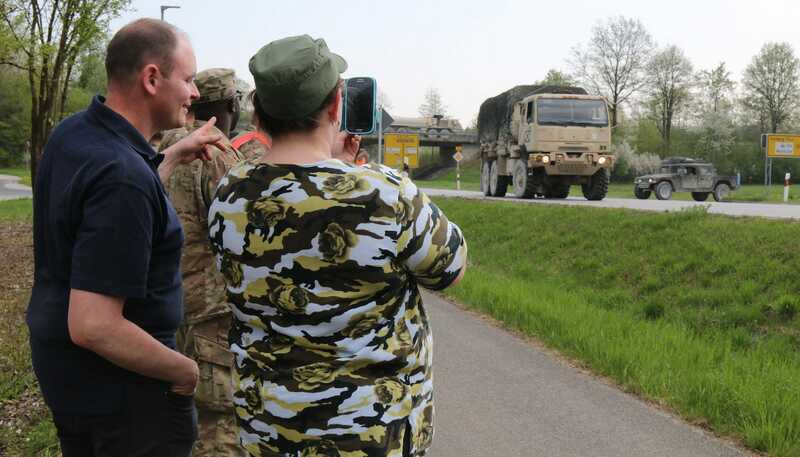 In late April, the 2nd Armoured Combat Brigade Team from the Army’s 1st Infantry Division carried out a tactical road march with over 700 vehicles on public roads between the Grafenwoehr and Hohenfels in southeast Germany – the first time the exercise has been done at the brigade level in 15 years. 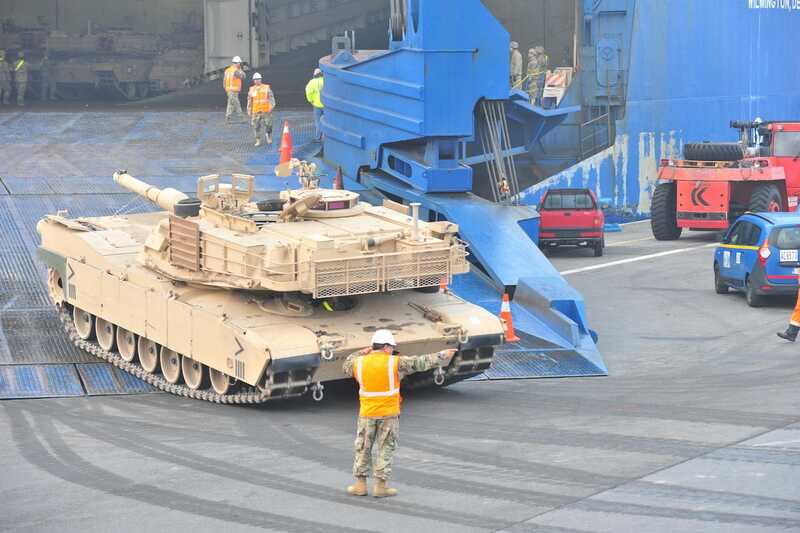 A few weeks later, the 1st Armoured Brigade Combat Team from the 1st Cavalry Division arrived for the next nine-month rotation, disembarking in Antwerp, Belgium, across the continent from its base in Germany. By arriving in Western Europe, the force could practice manoeuvring across the continent by road, rail, and barge. US Army/Sgt. 1st Class Jacob A. McDonaldA US soldier guides an M1 Abrams tank off ARC vessel Endurance at the Port of Antwerp, Belgium, May 20, 2018. In addition to military vehicles and personnel, the alliance’s members are mustering all the supplies they will need to support the nearly month-long exercise. According to the Norwegian armed forces, 50 camps will be set up, 2o of which can hold more than 500 people and the largest of which will hold 5,500 people; 35,000 beds will be set up in the exercise area; 1.8 million meals will be served before and during the exorcise, and 4.6 million bottles of water will be provided during it; 650 tons of uniforms will be washed.